Join us for MAF's 2018 Block-toberfest Celebrating Careers in Construction Month! 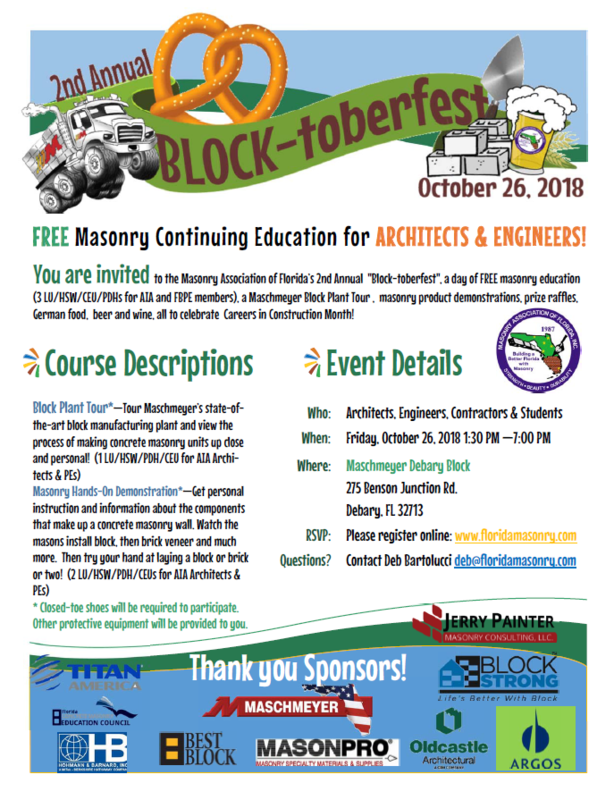 ​You are invited to the Masonry Association of Florida’s 2nd Annual "Block-toberfest", a day of FREE masonry education (3 LU/HSW/CEU/PDHs for AIA and FBPE members), a Maschmeyer Block Plant Tour , masonry product demonstrations, prize raffles, German food, beer and wine, all to celebrate Careers in Construction Month! Participants must wear closed-toe shoes to participate. All other protective equipment will be provided. Block Plant Tour*—Tour Maschmeyer’s state-of-the-art block manufacturing plant and view the process of making concrete masonry units up close and personal! Masonry Hands-On Demonstration*—Get personal instruction and information about the components that make up a concrete masonry wall. Watch the masons install block, then brick veneer and much more. Then try your hand at laying a block or brick or two!